A fascinating new example of Mac malware has been discovered, that appears to be adopting an old Windows-style disguise to fool users into running it. Despite the numerous times that cybercriminals have created boobytrapped PDF files that exploit vulnerabilities to infect unsuspecting users, many people still think that PDF files are somehow magically safer to open than conventional programs.The OSX/Revir-B Trojan plays on this by posing as a PDF file. When the malicious Macintosh application file is run it tries to drop a PDF embedded inside it onto the user's hard drive. The Chinese language PDF file displayed is about a controversial topic, "Do the Diaoyu Islands belong to Japan?" The Diaoyu Islands (known as the Senkaku islands in Japan) are the subject of a long-running dispute between the two countries, with both claiming sovereignty. 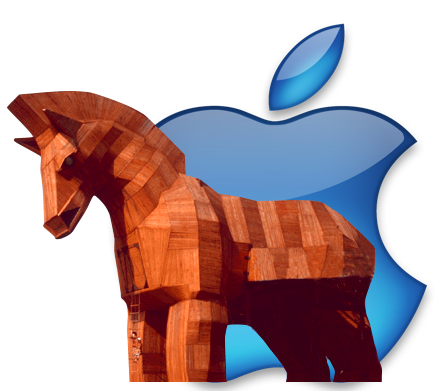 The malware attempts to install a backdoor Trojan horse (detected by Sophos as OSX/Imuler-A) which would give malicious hackers remote access to your Apple Mac computer.